Businesses thrive when their employees are committed to doing high-quality work that helps the company compete in the marketplace, and that’s where an employee recognition program comes in. Today, employees are as likely to leave a business due to lack of appreciation as they are over a desire for higher compensation. To retain your top talent and sharpen your competitive advantage, you need to go above and beyond to keep your people motivated and engaged—and that means more than just offering competitive compensation and benefits packages. 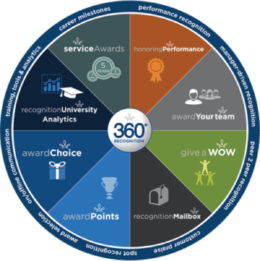 As more and more businesses strive to make their workplace more appealing and their company culture more unique, a clear and focused employee recognition program becomes more important than ever. When every company offers a great work environment, employee recognition can help set you apart and make all the difference to job seekers. Beyond just incentives, an effective employee recognition program can make employees feel special, valued, respected and supported. The program is designed to help your company create meaning through an integrated employee recognition program. Employees who receive frequent, public recognition for their contributions tend to be more engaged, and thus more motivated to do their best work, put in extra effort and advance in their role more quickly—not to mention share their positive experiences with colleagues, customers and potential new hires. This all contributes to creating an outstanding company culture and enticing work environment—one that can attract and retain top talent. When you go above and beyond for your employees, they’ll go above and beyond for you—and that can do wonders for strengthening your competitive advantage. Find out how Terryberry can help you create and implement a fully-integrated employee recognition program.